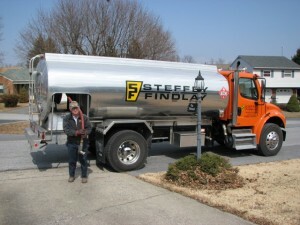 Steffey & Findlay is the oldest fuel oil distributor in Washington County. Since 1937 we have provided the local community with quality fuel oil service. We are locally owned and operated. Our drivers are experienced, knowledgeable, courteous and dependable. For service on your burner, we have contracts with outstanding service personnel. 1. Regular Plan – Cleaning of burner. Other repairs are billed as they occur. 2. Special Plan – Cleaning of burner plus parts and labor for specified repairs that occur during the year. Other repairs are billed as they occur. Contact us for the details of these two plans. You may call us each time you want a fuel oil delivery or you can request automatic delivery. With the information we gain from filling your tank twice, we can calculate how often you need a fuel oil delivery. We can then use this information to put you on automatic delivery which means we will deliver your oil to you at the proper time without you having to keep track of your oil tank level. 2. 30 day credit account. We extend to credit approved customers a period of 30 days to pay their fuel oil invoices. Finance charges will not be incurred if payment is received in the month following delivery. 3. Budget plan. A very popular program for credit approved customers is our budget plan. This plan allows our customers to spread their heating bills over a 10 month period, allowing them to avoid the financial bind which could otherwise occur in the winter time. Based on their previous year’s usage, we make a projection as to their current year’s expense. We divide that amount by 10 and ask them to make 10 equal payments from September through June. The monthly payment could be adjusted during the year if it were determined that prices or delivery quantities were considerably different from the estimate. 4. Auto pay. With your permission we can automatically collect a payment directly from your checking account through electronic funds transfer. This option is available for both 30 day credit account and budget plan customers.